Here is the first part of my cross stitch quilt blocks from a design by Whispered by the Wind. I am stitching along with nine other ladies. 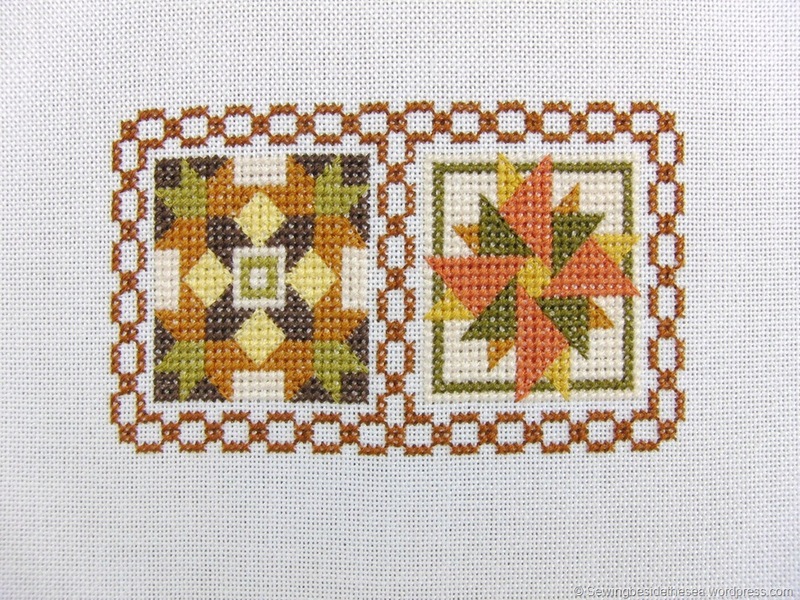 The blocks should be outlined with contrasting coloured backstitch but I decided to use matching threads instead. I have also changed the block colour placement quite a lot. I know, I’m very naughty! It looks like a simple design but it was surprisingly stitch intensive. There are 20 blocks to choose from and the finished piece will be 5 x 5 blocks. I’ll be randomly choosing which one to stitch next. Here are the first two blocks together. I should have four completed blocks ready for the next update. 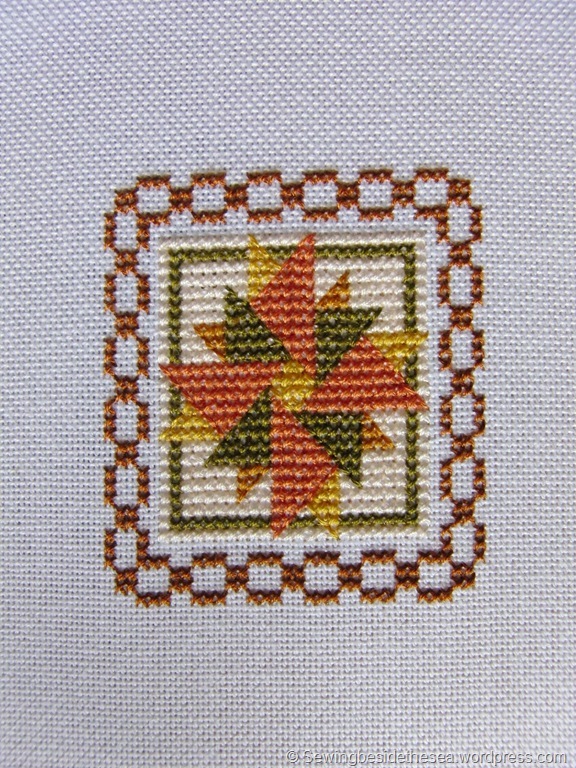 The SAL group now has ten stitchers including me and the links to their blogs are below. Claire is also doing the above design but, as usual, we are sewing very different versions. You’ll have to pop across to Claire’s blog to see how she has decided to stitch it. Everyone else in the group is working on a project of their choice, using the three weekly updates as motivation to complete at least some stitching. Please bear in mind that group members are located all over the world, so if you don’t see today’s post on their blogs yet, it could be due to time difference. We’ll publish the next update on 2nd November. Here are the links. Just click on the names below. Claire, Gun, Kate, Carole, Eleanor, Alison, Jule, Elizabeth and Wendy. This is gonna be so great!! Great colours! 🙂 Which reminds me of a WIP with similar blocks that is waiting for a finish. I also experienced those little blocks are not something quick to make. Lovely autumnal colours. It must make a nice change producing such a tiny ‘quilt’! It’s about all I can manage at the moment. Large projects don’t even get a look in! Love the colour choices you have made and it will be interesting to see the ‘quilt’ grow! Looking forward to see which block you choose next. They are all lovely blocks. I have to admit this is rapidly becoming a project that is “inspired by” the original. I’ve deviated so much from the chart after only three blocks. That’s what it’s all about and I’m loving it! Gorgeous work. Sometimes it’s the smaller pieces that are more time consuming but they sure are worth it. Lovely border too. Hi Carolyn, welcome to my blog 🙂 It has been fun so far. I don’t have a lot of spare time at the moment so this is a nice project to work on.